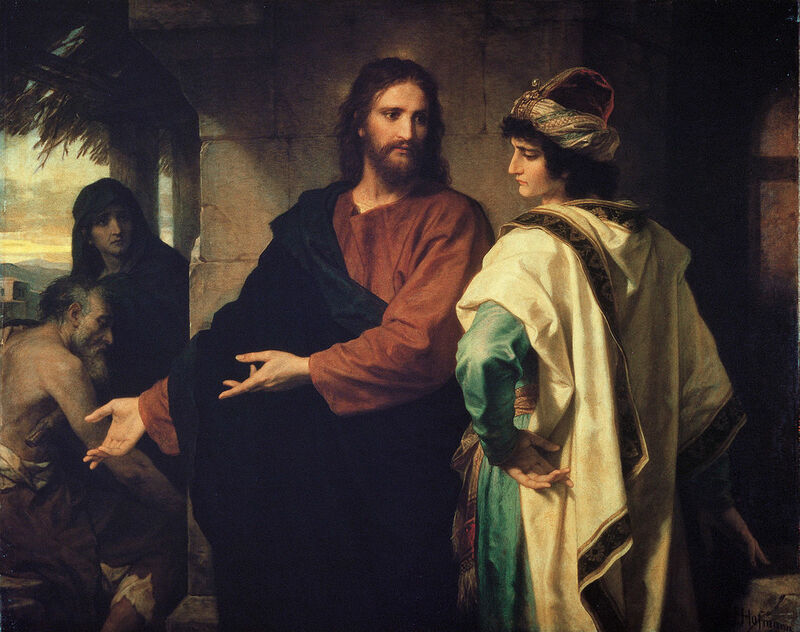 Christ and the Rich Young Ruler by Heinrich Hofmann, 1889. Happy New Year everyone! It’s the beginning of a new year and it is my hope and prayer that the Lord will continue to bless us with His peace and hope. The peace of God peace comes only through Christ by the power and presence of the Holy Spirit. The Lord also gives us hope, a deep abiding trust that God will be with us no matter the circumstance. Now the God of hope fill you with all joy and peace in believing, that ye may abound in hope, through the power of the Holy Ghost (Romans 15:13). Of course the ultimate expression of our hope from heaven is the return of the King of Kings. Looking for that blessed hope, and the glorious appearing of the great God and our Saviour Jesus Christ (Titus 2:13). It is my hope that you will find your true peace in Jesus Christ. If you are looking forward to this new year with fear or uncertainty then know that Christ can calm your fear and bring peace in the midst of turmoil. I am just like you, I do not know what the future will bring in this new year. God looks at our world and He must weep at all the sin, degradation, and unbelief. Most of the turmoil we see on the news is caused by human sin and selfishness. Behind it all humanity is pushed forward into even greater sin by the Fallen Dark Powers that rule the world from the spiritual dimension. I often wonder why the Lord allows it to go on, but I also know that He has reason for allowing things to progress as they are. 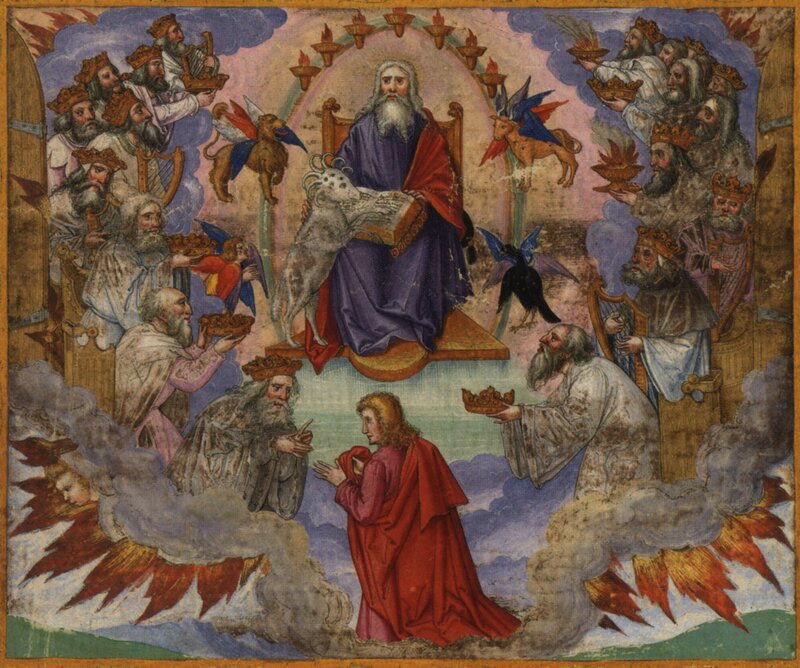 He sees the evil that goes on behind the scenes, among both humans and fallen angels; and although they may think they have the upper hand, it is the Lord who rules over the affairs of both men and angels. Our ultimate battle though is with the Fallen Ones who operate behind the scenes. That is why the apostle Paul said we should be “strong in the Lord, and in the power of His might” (Ephesians 6:10). Paul goes further by instructing us to “Put on the whole armour of God, that ye may be able to stand against the wiles of the devil (Eph. 611). It is important to know that when Paul made use of the word “wiles” he used the Greek word methodeia which refers to the cunning arts used by the Devil and his fallen angels. It refers to satanic crafts and methods of trickery devised by Satan to lead humanity away from God and Christ, and into the darkness of sin and depravity. Think about one of the main methods employed by the Fallen Ones: the sin of idolatry. The sin of idolatry, or the worship of false gods, destroys more souls than any other sin on earth. Indeed, idolatry is designed to move humanity far away from the true God into all kinds of evil activities and beliefs. The main focus on this blog is the sin of alien idolatry. If the Fallen Ones can lead someone into the worship of alien gods his work is done. Ultimately, the sin of alien idolatry will lead to destruction. For proof of this we need look no further than the Heavens Gate cult , which in 1997 resulted in the mass suicide of 39 people. What was their goal? To join a UFO they thought was following the Hale-Bop comet. Their leader, Marshall Applewhite, said “it was the only way to evacuate this Earth.” Later two former members of the group also committed suicide. Everyone who follows the lie of the alien gods will be destroyed in the end because this sin, like all sin, leads to the Broadway of eternal destruction: a Christless eternity, forever cut off from the presence and blessings of God. According to the book of Revelation during the Great Tribulation billions of souls will follow the Beast: this is the ultimate UFO cult which will find its expression in worldwide worship of alien gods: the Beast and the Dragon, an alien reptilian image by the way. Rev.13:4: And they worshipped the dragon which gave power unto the beast: and they worshipped the beast, saying, Who is like unto the beast? who is able to make war with him? The Greek word for dragon is drakōn, defined as “a dragon, a great serpent, or a name for Satan.” According to Strong’s it is also a “a fabulous kind of serpent (perhaps as supposed to fascinate).” This is interesting when you realize that the root word of drakōn is the Greek word dérkomai which means “to look, to see.” It refers to the keen eyesight of the serpent. This is an allusion to the Serpent in the Garden of Eden who was more “subtle” or “crafty” “than any beast of the field which the LORD God had made” (Genesis 3:1). The Serpent we deal with today is the same creature that confronted our first parents in the Garden. His eyesight is very keen as he works his subtlety or craft on each of us. He knows our weaknesses; and he works night and day to lead us away from Christ into the dark depths of the knowledge of good and evil. As we enter the new year of 2016 let us commit our ways unto the Lord. As the Word says “In all thy ways acknowledge him, and he shall direct thy paths” (Proverbs 3:6). In that way, and by faith through the power of the Holy Spirit, the Lord will enable us to stay on the narrow path, “Because strait is the gate, and narrow is the way, which leadeth unto life, and few there be that find it” (Matthew 7:14). “Woe to the idol shepherd that leaveth the flock! the sword shall be upon his arm, and upon his right eye: his arm shall be clean dried up, and his right eye shall be utterly darkened” (Zechariah 11:17). 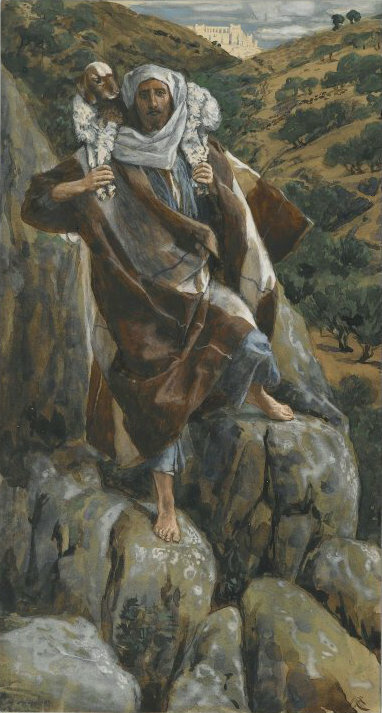 The Good Shepherd by James Tissot, Brooklyn Museum, 1894. One of the titles of Jesus is the Good Shepherd (John 10:11). As the Good Shepherd He saves and protects His flock from the Idol Shepherd, who is clearly a wolf in sheep’s clothing. Many theologians over the centuries have attributed the above verse from Zechariah to the final end-time Antichrist, the great enemy of both God and man. It speaks of the coming judgment on the Antichrist Beast. Jesus said, “I am come in my Father’s name, and ye receive me not: if another shall come in his own name, him ye will receive” (John 5: 43). The Idol Shepherd will come in his own name, and his name is Destroyer (Rev.9:11). This is in contrast to Jesus, whose name means “Jehovah is salvation.” The Idol Shepherd “comes to kill, steal, and destroy” (John 10:10); this is in contrast to Jesus who comes to “save His people from their sins” (Matt.1:21). Jesus gave his life for the sheep, and the Idol Shepherd will take life from the earth. Jesus is the True Vine (John 15:1), and the Idol Shepherd is the Vine of the Earth (Rev.14:19). Those who worship the Good Shepherd do so in spirit and in truth, but those who worship the Idol Shepherd worship the Lie, in the spirit of Strong Delusion. In fact, the Idol Shepherd will demand the worship of the world. Instead of the Son of Man, the world will embrace the Man of Sin. Instead of the Son of God, the world will accept the Son of Perdition. The world has turned its back on the Light of the World, and instead embraced darkness. John said, “light is come into the world, and men loved darkness rather than light, because their deeds were evil” (John 3:19). So, in keeping with the spirit of the world, which is the spirit of antichrist, the world system has chosen the Idol Shepherd over the Good Shepherd. Instead of the gospel of Christ, the world has embraced the gospel of Antichrist. Instead of Christ, the world will clamor for Antichrist. Instead of the True Prophet, the world will demand the False Prophet. Instead of the True Gospel (1 Cor.15:1-4), the world will embrace Another Gospel, the gospel of the Serpent (Genesis 3:4-5; ye shall be as gods). The Good Shepherd is from Heaven, the Idol Shepherd is the Beast from the abyss. He will be received by the world with open arms, will institute another gospel and system of worship (the image and mark of the Beast), and bring to humanity another spirit: the full manifestation of the spirit of antichrist. “Let no man deceive you by any means: for that day shall not come, except there come a falling away first, and that man of sin be revealed, the son of perdition; Who opposeth and exalteth himself above all that is called God, or that is worshipped; so that he as God sitteth in the temple of God, shewing himself that he is God” (2 Thess. 2:3-4). While I do believe it is entirely possible the Antichrist will walk into a rebuilt Temple in Jerusalem, could it also be that he will walk into the individual hearts of billions of people by the power of the spirit of antichrist once the restraint of the Holy Spirit is removed? The human heart is also called the Temple of God in the New Testament. Know ye not that ye are the temple of God, and that the Spirit of God dwelleth in you? If any man defile the temple of God, him shall God destroy; for the temple of God is holy, which temple ye are (1 Cor.3:16-17). What? know ye not that your body is the temple of the Holy Ghost which is in you, which ye have of God, and ye are not your own (1 Cor. 6: 19)? The Idol Shepherd is called “Idol” for a reason: He will become the idol in the sanctuary of the human heart. Billions will receive him by the power of the spirit of antichrist in much the same way that people today receive the real Jesus Christ through the new birth, and the indwelling power of the Holy Spirit! Don’t wait for the Strong Delusion to overtake you: open your heart today to the real Jesus Christ, the true Good Shepherd! Satan before the Lord by Corrado Giaquinto, 1750. The spirit of antichrist is a powerful force in the world. Its purpose is to blind the mind in order to prevent the reception of godly truth, especially truth regarding personal salvation through Christ as found in the Bible. Spiritual blindness is a principle in Scripture. 2 Corinthians 4:3-4: But if our gospel be hid, it is hid to them that are lost: In whom the god of this world hath blinded the minds of them which believe not, lest the light of the glorious gospel of Christ, who is the image of God, should shine unto them. 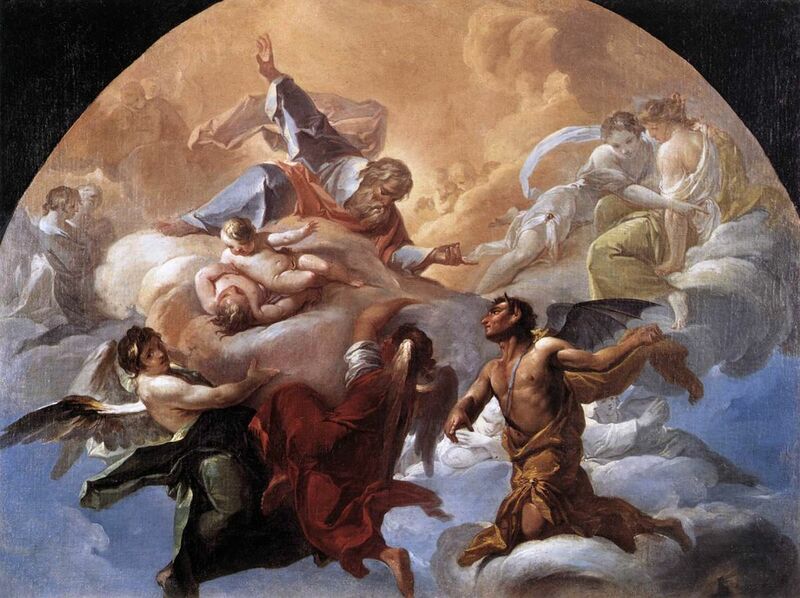 The god of this world of course is the Fallen Cherub, Satan, who uses spiritual power to his advantage, working in the minds of all people to blind them to the truth. That is why we have so many lies in the world. That is also why we have so much evil: the human proclivity toward evil is driven in part by the spiritual blindness imposed by Satan and his fallen angels. The main power behind human evil though is personal sinfulness; we cannot discount that. The only remedy for both, satanic interference, and natural human sinfulness, is forgiveness and redemption which is found only in Christ. Salvation through Jesus opens the blinded mind, sets free the sinful captive, and provides power to overcome personal sin. Christ also provides healing and deliverance from the dark powers who rule the current world system. 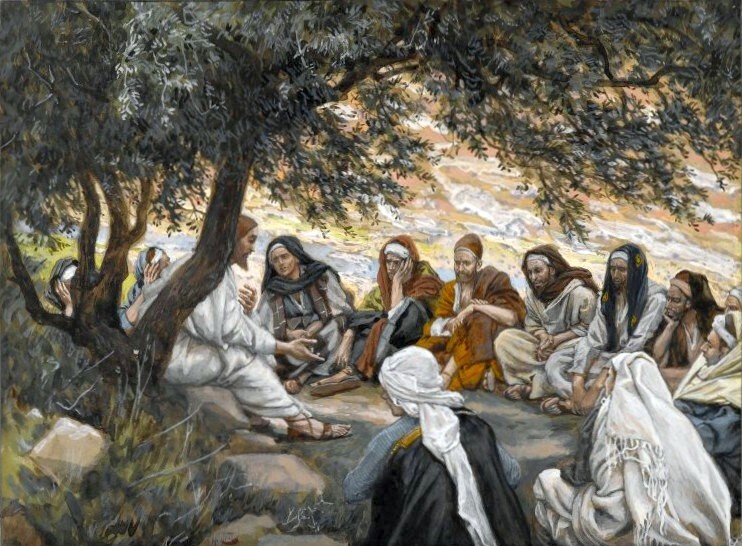 “Wherefore God also hath highly exalted him, and given him a name which is above every name: That at the name of Jesus every knee should bow, of things in heaven, and things in earth, and things under the earth; And that every tongue should confess that Jesus Christ is Lord, to the glory of God the Father” (Philippians 2:9-11). All beings in the universe, both human and spiritual, must bow the knee to honor and reverence the person of Christ. All must yield to His authority, “in devout recognition of the name which Jesus received from God” (Thayer). That is why the Christian can use the name and power of Christ to overcome sin, and fallen spiritual powers. Only Christians can repel and stop a satanic attack through the name of Christ. Non-Christians do not have this authority; they can however call upon the name of Jesus. His grace provides for all. But a demonstration of the power of His name is intended to lead the lost one to Christ, His name is not a toy to be played with, nor are we engaged in a game: the battle is real and fallen entities are real. Satan does not play games–he plays for keeps, and that my friends is eternal hell. The conspiracy we face is real. The god of this age has spiritually blinded most of the human race. An unfortunate truth is that most of humanity will not enter the Kingdom of Heaven because they refuse to accept the truth about Christ and the redemption He provides. They are “blinded” by the allure of the world, the desires of the sinful nature, and the god of the current world system (1 John 2:15-17). This is why so many people believe in aliens, false religions, and the many other lies that permeate the current world system. If we refuse truth when presented with it, we open ourselves to even more lies, and in the end, the last lie will be the strong delusion. Shockingly, the biggest lie in the world will come to the people of Earth from God; it will come through the unveiling of Antichrist, and will be a strong judgment against an unbelieving, rebellious world. Although that is a hard truth to accept, it is a deep spiritual truth presented in His Word. The lie of the Man of Sin, the Antichrist, will be presented to the world because they refuse His truth. It’s that simple. Once the restraining power of the Holy Spirit is removed the revelation of Antichrist will come. “And then shall that Wicked be revealed, whom the Lord shall consume with the spirit of his mouth, and shall destroy with the brightness of his coming: Even him, whose coming is after the working of Satan with all power and signs and lying wonders, And with all deceivableness of unrighteousness in them that perish; because they received not the love of the truth, that they might be saved. And for this cause God shall send them strong delusion, that they should believe a lie: That they all might be damned who believed not the truth, but had pleasure in unrighteousness” (2 Thess.2: 8-12). Paul wrote: “and for this cause God will send them energeia plane or strong delusion. The delusion is sent “because they received not the love of the truth, that they might be saved.” This makes it clear why God sends the strong delusion. Don’t believe the lies of this world. Don’t believe the lies coming to you from the media, and certainly don’t fall for the alien lie. The illusions of UFOs and aliens are lies created by the god of this world to lead you from the truth of Christ. God, through Christ created the world and everything in it (Colossians 1:16), not aliens, or evolution (which is another big lie). The coming lie that will flow from the mouth of the Arch Deceiver to the world is that our creator is not God, but an advanced race of extraterrestrial aliens. The lie will be convincing because it will be very difficult to dismiss the aliens, and their lies, when they are standing right in front of you. Seek the truth of Christ. Read His Word, and allow the blessed Holy Spirit to lead and guide you into all truth (John 16:13). Do not walk according to the lies of this world. Walk in the ways of Jesus, He will show you the way because that is who He is: He is the way, the truth, and the life (John 14:6). Ephesians 4:17-18: This I say therefore, and testify in the Lord, that ye henceforth walk not as other Gentiles walk, in the vanity of their mind, Having the understanding darkened, being alienated from the life of God through the ignorance that is in them, because of the blindness of their heart. PLEASE NOTE: This is the last week to send your entry for the book Alien Antichrist. 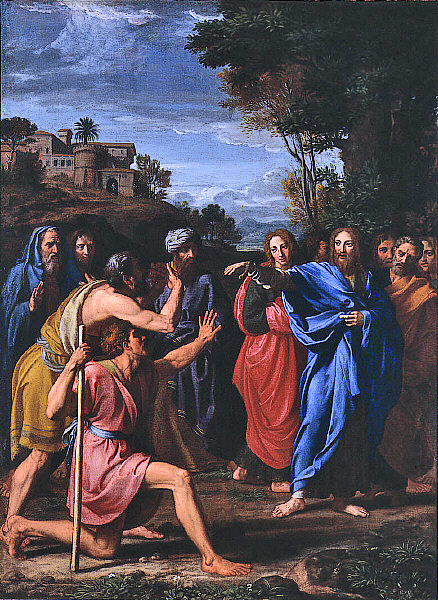 Christ healing the blind, by Nicolas Colombel, 1682. With all that is happening in the world it is easy to be down and discouraged, if not frightened. I don’t need to give you an unending laundry list of problems to prove my point. All of you know what is going on in the world. All of you read the news, and you are probably asking the same questions I am, especially the why question. The questions are natural, and there is nothing wrong with them. All of us are seeking answers because we are all in the same boat. Truthfully, our planet is reeling under tremendous pressures at this moment as we move forward, getting closer to the fulfillment of prophetic time. What do I mean by prophetic time? By that I am referring to the period of time when God begins to directly intervene in the affairs of the world. It is His time to deal with the nations as He works to bring the world under total submission to His rule. For this to happen though we must go through the trials of the Great Tribulation. The good news is, all of the troubles of the world will come to an end at the Second Coming and the Millennial Reign of Christ. Meanwhile, God is directing the course of events, of that I am confident. Looking at everything going on though, it’s almost as if He has forgotten us. It’s not that He has abandoned us to the woes of our planet as we spin around the sun. He is with us, and will be with us till the end of time. So don’t be discouraged at the End of Days because there is hope; although it is not found in the empty promises of politicians, or pie-in-the sky proclamations of the religious prophets of the world. Our hope is found in Jesus Christ, and the Bible here and now, and ultimately, at His return. Luke 18:35-43: And it came to pass, that as he was come nigh unto Jericho, a certain blind man sat by the way side begging: And hearing the multitude pass by, he asked what it meant. And they told him, that Jesus of Nazareth passeth by. And he cried, saying, Jesus, thou Son of David, have mercy on me. And they which went before rebuked him, that he should hold his peace: but he cried so much the more, Thou Son of David, have mercy on me. And Jesus stood, and commanded him to be brought unto him: and when he was come near, he asked him, Saying, What wilt thou that I shall do unto thee? And he said, Lord, that I may receive my sight. And Jesus said unto him, Receive thy sight: thy faith hath saved thee. And immediately he received his sight, and followed him, glorifying God: and all the people, when they saw it, gave praise unto God. 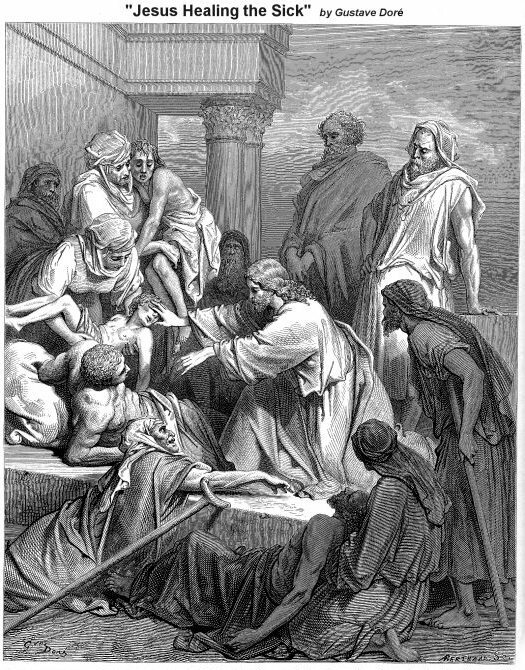 Jesus healing the sick by Gustav Dore, 19th century. Sometimes we just have to cry out to God for understanding, and the Bible promises that He will hear, and provide insight, wisdom, and guidance. “If any of you lack wisdom, let him ask of God, that giveth to all men liberally, and upbraideth not; and it shall be given him” (James 1:5). I have yet seen the moment when I sincerely asked for wisdom and the Lord turned me down. He does freely give wisdom to those who want to listen, and He also opens the eyes of the blind so they may see the truth. But I must warn you: when you ask God for wisdom, He will provide exactly what you need, and if He deals with your heart about an issue you must give heed. That is part of receiving from God, you have to accept the whole package. If you are unwilling to act on His Word, the truth is, He won’t give it: and, you must have faith, and not be double minded. James 1:6-8: But let him ask in faith, nothing wavering. For he that wavereth is like a wave of the sea driven with the wind and tossed. For let not that man think that he shall receive any thing of the Lord. A double minded man is unstable in all his ways. Faith is important, but not blind faith; that is like walking into a dark tunnel believing the end is near when in reality, the end is sealed up and dark, with no hope of escape. Contrary to what atheists and unbelievers claim, faith in the God of the Bible is not blind. Throughout the centuries God has proven Himself faithful to those who choose to hold to His Word. That is why He gave us the Bible in the first place: for it is in the ancient pages of the Bible that the people of our time, in our place in history, can clearly see how God has worked in ages past, and how He intends to work in the future. The Bible states that “faith is the substance of things hoped for, the evidence of things not seen (Hebrews 11:1). According to Albert Barnes commentary, the word substance here rendered from the Greek word hupostasis which means “confident, or confidence.” What this means is that our trust in God has a substantial quality, (it is not a heartfelt fantasy), because it is founded on the nature of God as revealed in the Bible. In other words, we have confidence in God through His Word, which develops over time as a firm trust leading to assurance; and assurance in the nature of God builds confidence that He exists and can be trusted because of the evidence found in history and the Bible. That is why Paul rightly stated, “But without faith it is impossible to please him: for he that cometh to God must believe that he is, and that he is a rewarder of them that diligently seek him” (Hebrews 11:6). Christ walking on the sea, by Amédée Varint, 19th century. The bottom line is that our faith is a firm confidence in God: we learn to trust Him as we become more familiar with His ways as revealed in the Bible. Even when we are not faithful God remains so. Our faith or confident trust in is in the character of God. We learn that He is one who can be relied on in good times, and in bad. He holds the future of the world, and He also holds my personal individual future. Isaiah 46:9-10: Remember the former things of old: for I am God, and there is none else; I am God, and there is none like me, Declaring the end from the beginning, and from ancient times the things that are not yet done, saying, My counsel shall stand, and I will do all my pleasure. That is why we sometimes ask the why questions. We find it rather hard to believe that God allows evil, and evil things to continue, especially when the evil in this world touches us, or our loved ones. We must remember that we live in a fallen world filled with fallen people, and fallen spiritual beings. And reading the Bible we also begin to understand that God has a purpose for allowing the hard difficult things, even if we can’t understand why at the moment. 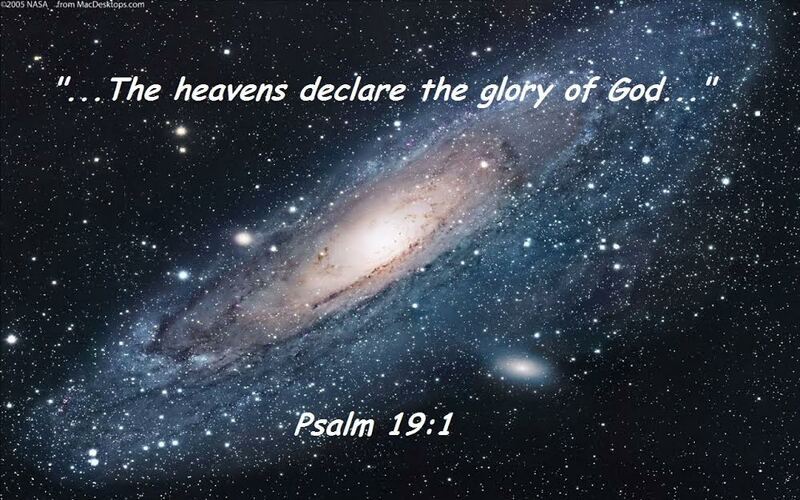 Could that be why Paul said that the sufferings of this world produce in us a kind of glory for an eternal purpose? For our light affliction, which is but for a moment, worketh for us a far more exceeding and eternal weight of glory (2 Corinthians 4:17). According to Thayer the word weight means “a weight of glory never to cease, a vast transcendent glory or blessedness.” I would rather be blessed in eternity, than be cursed, or curse the present world, wouldn’t you? When we place our faith in the eternal God, no matter the circumstances, He will answer with His presence, power, comfort, and strength. Like many people, I have seen great suffering in this world. But when I choose to place my confidence in Christ, I have yet to see Him fail to provide exactly what I need at the moment. His truth is real, personal, and incredible. One promise that we should all hold to is that Christ loves and cares for us individually. His Word promises that He will never leave us, nor forsake us (Hebrews 13:5). He is always present to comfort the broken child, correct the wayward son or daughter, and lead and guide us into the eternal glory of His presence. I can believe Him, I can trust Him, and I can learn to walk with confidence in this sinful world knowing that he will always be there: “Even to the end of the world” (Matthew 28: 20). Please visit me on Facebook and “Like” the page. I place articles and commentary on the Alien Antichrist Facebook page. Join the discussion! Even more important, I encourage you to share these pages! The world is under such heavy deception right now, imagine what it will be like when the restraining power of the Holy Spirit is removed and the Antichrist is released to fulfill his evil work (2 Thessalonians 2:7-11) . So, share the pages, and expose the deception for what it is! If you would like to know more about Jesus Christ, and personal salvation from the sin of this present world, then click this link to go to the page, How to Know Jesus Christ. Without Christ there is no hope. What do atheists have to offer? They can argue reality or science all they want, but when cancer strikes, or a car wreck happens what can they offer? This world is more than the reality we see, there is a greater reality that extends far into eternity. Seek to know Jesus, find comfort in His Word, and in His presence. He is true and real, and right now He is reaching out a nail scarred hand, and He is waiting just for you. If you would like to learn more about Bible prophecy and the Great Deception of the Last Days the then I recommend my book Alien Antichrist, The Terrifying Truth about UFOs and Aliens, Antichrist, and the End of Days. The Lamb opening the book with seven seals by Matthias Gerung, 1530-1532. Has the first seal of the 7 sealed scroll of the book of Revelation been broken? 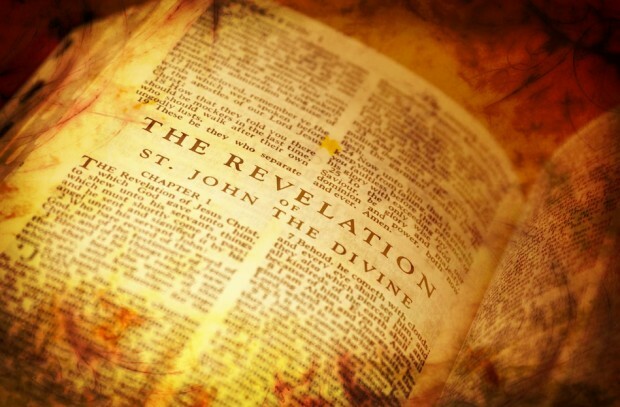 As you may recall, the Apostle John, the author of the book of Revelation, was shown a sealed scroll in heaven that no one was worthy to open (Rev. 5); only the Lamb of God was found worthy to receive the scroll and break the seals. This scroll was given to the Lamb, who is Jesus Christ, the Lamb of God “who takes away the sin of the world” (John 1:29). Jesus takes the scroll, breaks the first seal, and begins to unroll it. Each seal reveals an aspect of the judgment of God upon the Earth. Once the Lamb takes the scroll and the 1st seal is broken, John hears a loud noise like roaring thunder. With the breaking of the 1st seal, the noise of thunder is heard, which is an ominous warning of Divine judgment. And with that, John is invited to observe the resulting after-effects. It is then that he observes a rider on a white horse. That the rider has a crown is very significant. In this case the crown is the wreath worn by a conqueror. 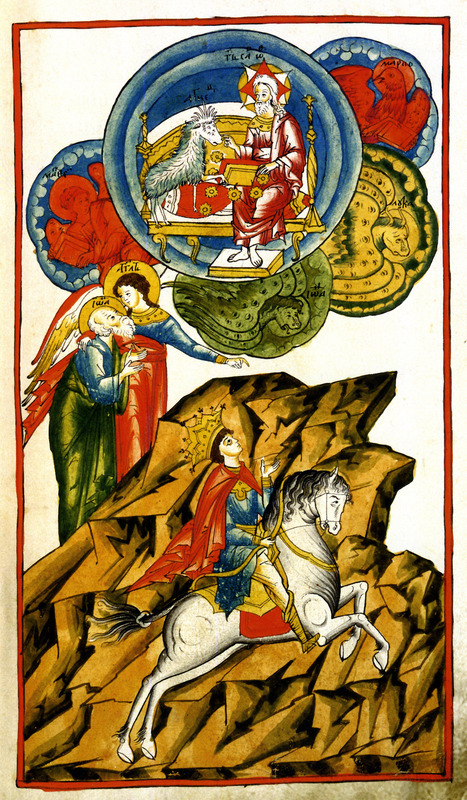 His power in conquest is also implied by the white horse, signifying his position as a victor. According to Albert Barnes, “the horse was an emblem of fleetness, and, consequently, of the rapidity of conquest.” With his bow and crown he goes forth as a victor, conquering the world. John 18:36: Jesus answered, My kingdom is not of this world: if my kingdom were of this world, then would my servants fight, that I should not be delivered to the Jews: but now is my kingdom not from hence. 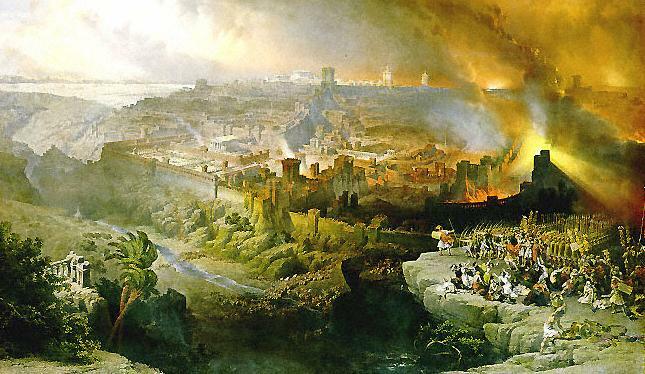 Jesus will subdue the nations at His Second Coming. But before He returns again, the world will experience the judgment of Antichrist. So the king of Revelation 6:2 is not Christ, but the embodiment of the spirit of antichrist, the Beast of the book of Revelation. He is also the Willful King of the prophet Daniel (11:36), and the man of sin, the son of perdition of the Apostle Paul (2 Thess. 2:3). He has many names in the Bible, but he is better known as the Antichrist, the antithesis of God and His anointed King, Jesus. Since the Antichrist Beast is released upon the Earth with the breaking of the 1st seal, I think we can reasonably conclude that the seal has not yet been broken. The person of the Antichrist is not yet active on the Earth at this time, however, the spirit of antichrist is. 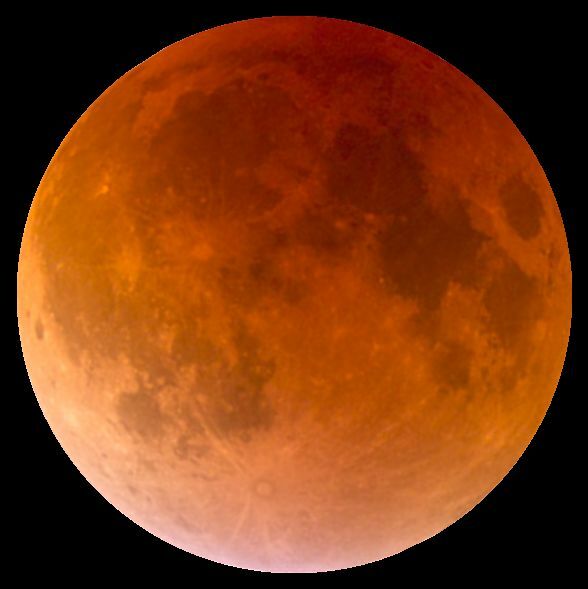 A few prophecy teachers today are declaring that the 1st seal has been broken, and they offer their arguments and proofs to substantiate their claims. But, I think if we forget the arguments and opinions, and stick with the biblical text, we can see that the seal is still intact at this point in time. The individual who is the Antichrist is not yet revealed. He is still imprisoned in Tartarus (see Rev. 9:11, and my book, Alien Antichrist). What we are seeing in the world today is the increasing power of the spirit of antichrist. At one time the United States was one of the most Christian nations on the face of the Earth. But since the 1960’s we have seen the increasing erosion of the Judeo-Christian standard and ethic that were the founding principles of America. Biblical Christianity is now seen by those in positions of power, such as the media and the courts, as an enemy of the state, and Bible Christians are seen as a threat to freedom and progress. This is why it is so important for those opposed to the Bible to remove displays of the Ten Commandments, public displays of faith and prayer, and other reminders of the Christian faith. Every religion and voice in the United States is allowed except the Bible and the Christian voice; you can also see this around the world, especially in countries dominated by Islam and various other religions that deny the unique position of Jesus Christ. Think about it: why is the name of every god on Earth allowed, but at the mention of the name of Jesus Christ, the hue and cry of atheists and others is deafening, and absolutely stunning. This is evidence that the spirit of antichrist is gaining more power and influence; and this trend will continue as we move closer to prophetic fulfillment. No, the 1st seal hasn’t been broken yet, but we may be closer than any of us can realize. Expect the spirit of Antichrist to gain more power and momentum, and also anticipate the power and influence of deception to increase at a very rapid rate. Yea, and all that will live godly in Christ Jesus shall suffer persecution. But evil men and seducers shall wax worse and worse, deceiving, and being deceived. But continue thou in the things which thou hast learned and hast been assured of, knowing of whom thou hast learned them; And that from a child thou hast known the holy scriptures, which are able to make thee wise unto salvation through faith which is in Christ Jesus. Please note: I am a little late this week posting articles and updating my blog. Last week powerful storms came through the area and knocked out my phones and Internet access. Thank you for your patience! Also, I post comments and links to articles that you may find interesting on my Facebook page. Go there and “Like” the page, and share the articles on this page as well. Lets get the word out about the alien deception! If you looking for an in-depth study on the alien deception, then read below for information about my book, Alien Antichrist. It contains more information than I can place here, or on Facebook! Check it out, and pick up a copy at Amazon or Barnes and Noble today! If you would like to learn more about the power of deception and the spirit of antichrist then I recommend my book Alien Antichrist, The Terrifying Truth about UFOs and Aliens, Antichrist, and the End of Days.